O God, who called the Priest Saint Sharbel Makhluf to the solitary combat of the desert and imbued him with all manner of devotion, grant us, we pray, that, being made imitators of the Lord's Passion, we may merit to be co-heirs of his Kingdom. Who lives and reigns with you in the unity of the Holy Spirit, one God, for ever and ever. St. Sharbel was a Lebanese monk, born in a small mountain village and ordained in 1858. Devoted to the Blessed Virgin Mary, he spent the last twenty-three years of his life as a hermit. Despite temptations to wealth and comfort, Saint Sharbel taught the value of poverty, self-sacrifice and prayer by the way he lived his life. This optional memorial is new to the USA liturgical calendar and was inscribed on July 24, 2004. According to the 1962 Missal of St. John XXIII the Extraordinary Form of the Roman Rite, today is the feast of St. Christina who was martyred at Bolsena in Italy, probably under Diocletian (c. 307). She has been greatly venerated since at least the 6th century. At the age of 23, Charbel (the name he chose when entering Novitiate) left his closely knit family to enter the Lebanese-Maronite Monastery called Notre-Dame de Mayfouk. Following studies and profession at St. Cyprian de Kfifane Monastery, he was ordained in 1859. Make a virtual visit to Our Lady of Lebanon Shrine. 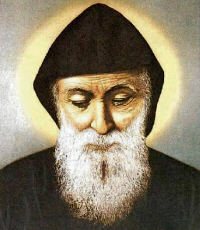 Visit this site dedicated to St. Charbel and read another biography. Listen to an Arabic prayer for God's Mercy from the Great Paraklesis (Supplicatory Prayer) to the Most Holy Theotokos. Notice the frescoes in the video of the praying saints which are from an obscure ancient Byzantine church in Maad, Lebanon, named after St. Charbel the old. Learn more about the Maronites. Saint Christina was the daughter of a rich and powerful magistrate named Urban. Her father, who was deep in the practices of paganism, had a number of golden idols. His young daughter broke them, then distributed the pieces among the poor. Infuriated by this act, Urban became the persecutor of his own daughter. He had her whipped with rods and thrown into a dungeon. Christina remained unshaken in her faith. Her tormentor brought her forth to have her body torn by iron hooks, then fastened to a rack beneath which a fire was kindled. But God watched over His servant and turned the flames back toward the onlookers, several of whom perished. The torments to which this young girl was subjected would seem as difficult to devise as to imagine; but God was beside her at all times. After a heavy stone was attached to her neck, Saint Christina was thrown into the lake of Bolsena, but was rescued by an Angel and seen wearing a stole and walking on the water, accompanied by several Angels. Her father, hearing she was still alive, died suddenly amid atrocious sufferings. A new judge succeeded him, a cruel pagan experienced in persecuting the Christians. He tried to win her by reminding her of her nobility, suggesting she was in serious error. Her reply infuriated him: “Christ, whom you despise, will tear me out of your hands!” Then Saint Christina suffered the most inhuman torments. The second judge also was struck down by divine justice. A third one named Julian, succeeded him. “Magician!” he cried, “adore the gods, or I will put you to death!” She survived a raging furnace, after remaining in it for five days. Serpents and vipers thrown into her prison did not touch her, but killed the magician who had brought them there. She sent them away in the name of Christ, after restoring the unfortunate magician to life; he was converted and thanked the God of Christina and the Saint. Then her tongue was cut out. The Saint prayed to be allowed to finish her course. 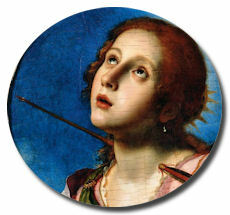 When she was pierced with arrows, she gained the martyr’s crown at Tyro, a city which formerly stood on an island in the lake of Bolsena in Italy, but has since been swallowed up by the waters. Her relics are now at Palermo in Sicily. Her tomb was discovered in the 19th century at Bolsena, marked with an inscription dating from the 10th century. Excerpted from Les Petits Bollandistes: Vies des Saints, by Msgr. Paul Guérin (Bloud et Barral: Paris, 1882), Vol. 9.